We couldn’t help but be intrigued by the ride posting of 18 billy goats (hill climbs in our bike club). We realized that would be impossible for us to do but the ride posted by Russ and Sheila had the great flexibility of offering three sequential rides, or laps, with a fixed route and optional billy goats. I guess if you did them all you would do more climbing than on the Devil Mountain Double. Russ and Sheila are getting ready for the Terrible Two Double Century next week. We skipped trying to make it to the 6:00 am start for Lap 1. Besides we already went up Quimby West on the tandem this year and once a year is enough. But we were anxious to climb Mt. Hamilton so we got there in time for Lap 2 at 8:30 am. Although there were eventually over 25 different riders on the 3 laps, about 20 of them were on Lap 2. It was a cool day for June. The group split as soon as we started the climb. The two tandems and several guys on single bikes went out ahead. We decided to get some pictures before we got dropped. The temperature dropped as we climbed and soon we were in heavy fog. We made a stop at the observatory and then headed down the backside. Those who had skipped the stop at the summit were already headed back up before we reached Isabel Creek. After we made a U-turn, I started the timer to see how long it would take us to climb up the backside. One of the other rides had a jersey that said “If you think this is too steep, you are getting too old”. That kind of inspired me to push even harder up the hill. With about 500 feet of climbing left my legs were about to give out but I said to Anne, I am not going to give up now after all this hard work to climb fast. She replied, “what are you talking about, you are not timing this climb are you?” “Of course”, I replied. I then realized that although I was pushing my heart rate over 160 all the way, Anne must have some reserve energy left, which really came in handy. It looked like we could come in under 50 minutes so I took my heart rate up over 170. We finally reached the top and set a new KOM time for ourselves. Although we are old, I guess this hill was not too steep for us. By the time we reached the summit the weather was much better than the first time up. It was a bit cool but there was some sun. We headed down to do Kincaid but decided we would only go out to reach Russ and Sheila coming back. The road on the first part of Kincaid was newly paved and nice to ride on. The clouds were beautifully set against the blue sky. We wanted to to a picture but with no one else there, we took pictures of each other and later merged them using Photoshop. Before we reached the bridge, we met Russ and Sheila coming up the hill. They stopped to wait as they could see were going to make a U-turn and join them. When they stopped they noticed they had a cut in their front tire and the tube was starting to protrude through. Their politeness of stopping to wait was rewarded with them discovering something that could have caused a blow out while they were later descending down Mt. Hamilton road. Like many of the tandems, they had a spare tire and quickly replaced their front tire. After deciding to skip Quimby East we were making the short climb up when I saw another snake in the road. “Did you see the snake?”, I asked. “No,” Anne replied, “You can see what is in front of you, I can only see a behind“. Back at the start we loaded our tandem in the car and went over to chat while Russ and Sheila were refueling for Lap 3. Some new riders were now showing up for the last Lap, which would include Sierra, Caleaveras, Welch Creek and many other options for those who want to prove that no hill is so steep that it makes them old. I was wondering how many miles and feet of climbing Russ and Sheila would get in. Maybe not all 18 Billy Goats, but enough that next week’s Terrible Two will not seem so terrible, I bet. It has been a long lull in serious training, with Franz’s cycling accident on April 8th, then the travel to Washington State, Utah, Atlanta and Florida. After returning from Atlanta, we started our crash recovery course on cycling, quickly getting ready to do a Century ride in Utah that Saturday. It was the first time for quite awhile for both Anne and I to reach 200 miles of cycling in a week. The next week we were now back in California and it we should have cycled more than we did, but the long ride we were planning on that Saturday turned out to be short due to very cold conditions. Today we decided to join the club ride “Lunch in Pescadero” but started at McKenzie Park, in Los Altos, so we could get some additional miles. 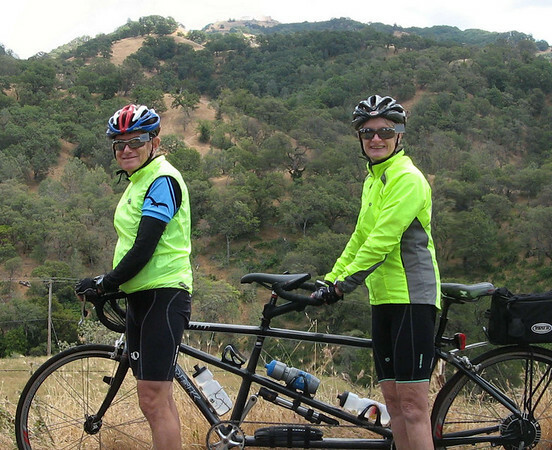 Russ and Sheila were planning to bike on their tandem from home and we met them on Foothill. Barley had joined them also. The five of us biked up Sand Hill Road, then over to Woodside to meet the rest of the riders who had driven to the start. It was then over to Old La Honda, down Highway 84 then over to Pescadero for some lunch. We needed a break because keeping up with these young riders took a lot of energy. The forecast had been for cloudy and cool but the weather had turned very nice and it was sunny in the mid 60’s. After splitting a sandwich, it was over Stage road to San Gregorio. But there was no stopping there, so we went on to Highway 1, then over to Tunitas Creek. Russ & Sheila and Barley were going to put in even more miles so we said goodbye at the bottom of Tunitas Creek, and then started the long climb of 2,000 feet in 6 miles. The difficulty of the climb was greatly minimized by the beauty of the surroundings. We are lucky to be able to do a local ride and be biking right up through the redwoods. We just had to stop to get a picture. We finally reached the summit and made a brief stop, the fist one since we had left Pescadero. Then it was down Kings Mountain, to Woodside and back to the car the way we had come. It was about 80 miles and 6,500 feet of climbing. See map of route. We feel we are finally in shape for the 10 day bike tour we will be starting in a little over a week. 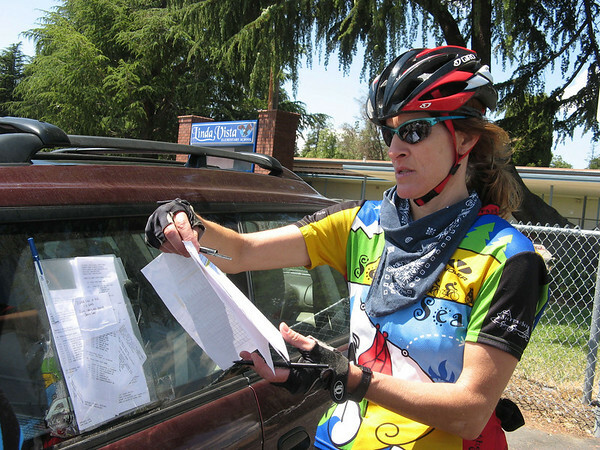 Anne has now biked 3,300 miles so far this year, even higher than last year at this time. Taking a look at the miles we have both biked so far this year, you can see that Anne’s mileage is much closer to that of Franz than in prior years. We really enjoy biking on the tandem. You can see that we had a period when we were not able to bike on the tandem while Franz was recovering, but for the past two weeks we are doing even a better job of getting ready for Sierra to the Sea than we did last year. It was over 280 miles on the tandem this week. Time to put on a new chain!